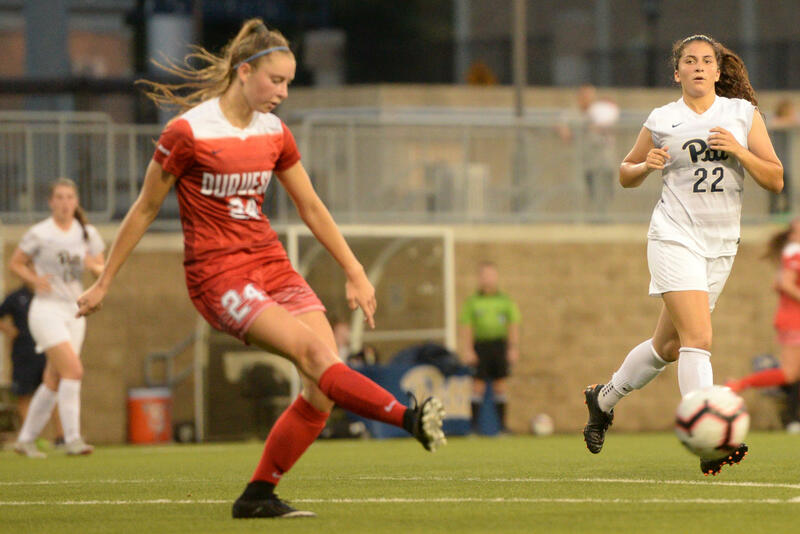 In the latest episode of Duquesne and Pitt’s crosstown rivalry, Pitt women’s soccer bounced back Thursday night and defeated Duquesne 2-0 at Ambrose Urbanic Field. Despite the Panthers’ tough 4-0 loss to TCU and 4-1 loss against North Texas during their road trip to the Lone Star State last weekend, they played solid at the back — never letting the Dukes build any momentum on the offense, especially in the second half, where the Panthers only allowed one shot. Redshirt junior midfielder Juliana Vazquez was proud of the team’s performance and how they were able to play much better defensively than they did last weekend. The game started off quickly, with Duquesne sophomore midfielder Deena DeBaldo getting a shot off, forcing redshirt sophomore goalkeeper Amaia Pena to stretch out to her right to make a difficult save. Panthers first-year defender Madeline Gravante responded by scoring an impressive goal in the sixth minute. The goal was set up after a beautiful ball played by first-year midfielder Mikayla Alcorn from behind the halfway line to first-year forward Ari Morgan. Morgan then passed it to Gravante outside the box, where she smashed it past the keeper into the right corner. Despite the fast-paced first five minutes, the rest of the first half slowed down considerably, especially on the offensive side of the ball. DeBaldo continued to press for the Dukes, totaling five shots with three on goal. Her best chance at a goal came in the 17th minute, when she tried to catch Pena off her goal, but her shot ended up going high instead. Pitt, meanwhile, wasn’t able to capitalize in the first half after scoring. They only had two more shots in the first half by Alcorn and first-year midfielder Mariona Segales had no corner kicks. However, Pena did hold her ground as she made three saves in the first half — a half that also saw the Panthers playing more aggressively, with five fouls to the Dukes’ two. The beginning of the second half was similar to the end of the first half, with little offensive action on either side. The first shot of the second half came in the 73rd minute, leading to a second Pitt goal. On the corner, Duquesne goalkeeper senior Kyra Murphy misjudged the ball as she attempted to punch it. The ball ended up bouncing to Gravante, who was able to put it in the back of the net for her second goal of the night. Gravante almost scored her third goal of the game right after another corner during which Murphy failed to get the ball out, but her attempt was blocked by a Duquesne defender. Senior defender Mikayla Schmidt also had a chance to score after getting a ball right in front of the goal following a great cross by Vazquez, but ended up shooting it over instead. Gravante, whose two goals against Duquesne were her first two as a Panther, was ecstatic about her performance and her ability to help the team on offense, which she noted was a different dynamic compared to her usual role on defense. While Pitt pushed higher on the offensive side of the ball in the second half, they also had some trouble as they were called offsides five times. Although getting back to a winning streak is exactly what the Panthers wanted, the upcoming schedule will be tough. They take on No. 16 Kansas at Ambrose Urbanic field on Sunday at 1 p.m., and then start their conference play in the ACC by taking on three ranked teams — No. 24 Louisville at home Sept. 15, No. 2 UNC Sept. 20 and No. 13 NC State Sept. 23. Coach Randy Waldrum knows this will be a challenge for his young team playing in the ACC — what is probably the toughest conference in women’s college soccer. But he remains positive.